When Apple rolls out a new phone, prices on its older models usually drop. So far, this has not proven to be the case for the new iPhone 7. Indeed, since its November 2016 launch, Apple users have continued to give the new model mixed reviews and demand for the iPhone 6 has gone up not down along with prices on these older models. Despite this, Apple’s new iPhone model offers many features that promise to make learning in motion easier and more versatile. This article considers the iPhone 7’s potential impact on mobile learning and why we should all be paying attention. There are two major complaints that consumers continue to launch about the iPhone 7. First, there is the drab or at least familiar design. Apple users are design savvy and the new iPhone looks much like the previous model. But this is not necessarily why Apple’s design team is now on the defensive. With the iPhone 7, Apple has arrived in a truly wireless era by removing the ubiquitous 3.5 mm headphone jack found on all its older models of phones, tablets, and computers. Moving forward, iPhone owners will be forced to use wireless headphones or wireless earbuds (Apple’s version is Airpods and these easy-to-lose earphones retail at a pricey $159.00) but don’t expect to use your Airpods on other Apple products (at least not yet). 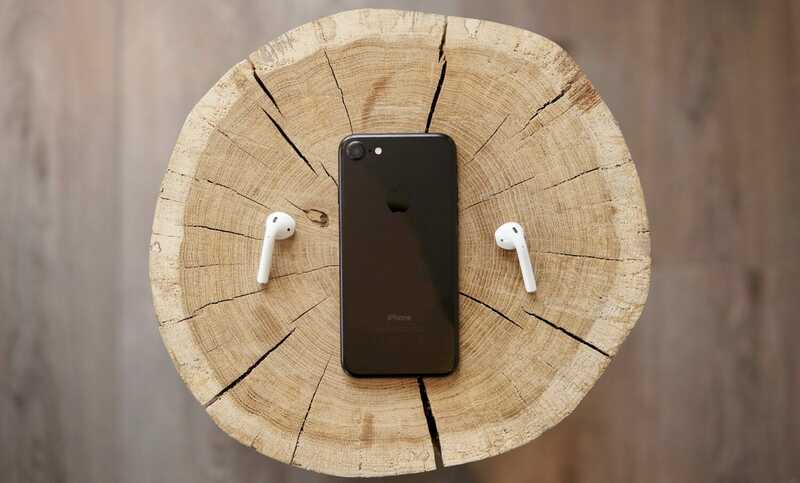 The company has yet to do away with the traditional headphone jack on its laptops, which means for now, Apple users will need to have both wired and wireless head- or earphone options on hand. While Apple’s decision to do away with the 3.5 mm headphone jack and make all iPhone users adopt a wireless alternative has not been universally applauded (and even wrangled some long-time Apple users), the move from wired to wireless earbuds is significant. In time, consumers and media historians may even look back on the company’s controversial move and see it as a notable technological transition. If earphones are an accessory, wireless earbuds, which look more like modified hearing aids than traditional earphones, may be better understood as a prosthetic. In other words, with the move to wireless earbuds, Apple is gently nudging consumers into an era when technologies will be increasingly embedded in our bodies rather than seen as external tools. It’s on this level that the controversial iPhone 7 holds the potential to impact mobile learning. Mobile learning (or mLearning) is typically still understood as something one does while stationary (e.g., watching a training video while sitting on a bus or completing a training-based game while lying in bed). As our devices become increasingly embedded (move from the status of accessory to prosthetic), new opportunities are pried open. Without the wires, our technologies become increasingly discrete. This means that moving forward, there will be more situations in which training instructions can be effectively delivered remotely to employees on the floor (e.g., even when they are in the view of customers). With the wires no longer in our way, consulting training materials may also be safer and more feasible in some contexts (e.g., on construction sites). While the immediate applications may be limited, the long-term potential of moving from wired to wireless earbuds can’t be ignored. Much like the still widely anticipated arrival of augmented reality devices that take the form of contact lenses rather than external glasses or visors, the move from clunky headphones and wired earbuds to discrete wireless earbuds is a move toward the next-generation of technologies and learning. Beyond its bold attempt to shift how we engage with our mobile devices by doing away with the traditional sound jack, iPhone’s new phone also offers users more storage space and faster processing speeds. This means that users will no longer need to waste time waiting for training videos to download. Indeed, we are now living in an era when one can reasonably expect their phone to be just as fast and efficient as any laptop or desktop. The real revolution in mobile learning, however, is likely let to come. Rumors have it that iPhone’s next model (iPhone 8) will finally do away with another external device (the charger). With remote charging on the horizon, dead batteries may also become a thing of the past in the near future.